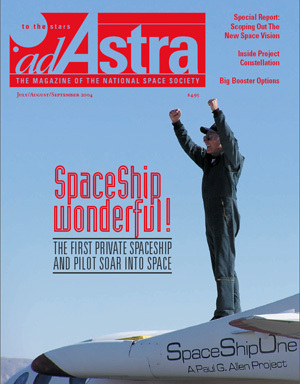 ON THE COVER: Scaled Composites’ SpaceShipOne returns from its short but historic venture into space. The Aldridge Commission Report: The remaking of NASA is only part of the job; the real test will be sustaining the vision over decades to come. NASA’s first step beyond low-Earth orbit begins with a new vehicle to transport cargo and people to the Moon. Engineers are studying a variety of options for developing new, more affordable heavy-lift rockets to carry astronauts back to the Moon and on to Mars. Going to Mars to stay. As plans shape up for robotic excursions to the Moon, NASA may want to consider that bigger isn’t necessarily better. Conference Draws NSS Members to Oklahoma, by James Spellman, Jr.